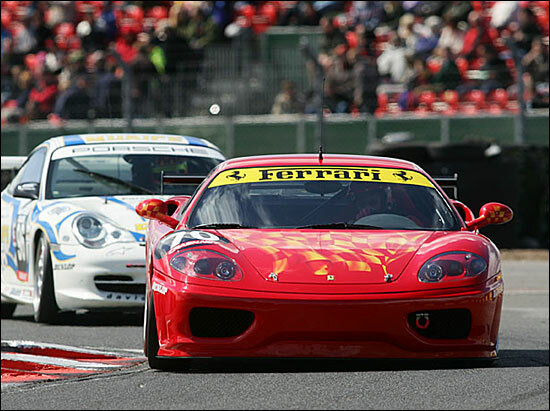 The Ferrari 360s had a tough time competing with the Porsches in last year’s GT3 Class of the British GT Championship – but Calum Lockie and David Dove, driving the latter’s car, will be doing their best to take on the 911s in 2006. David Dove only raced his car once in the British GT Championship in 2005, at Croft (below), but he and his new partner will be out for the whole season this year. Calum Lockie is going to have a busy season – with a regular drive in Belcar too, partnering Bo McCormick, in the latter’s Ferrari 360. Calum Lockie is also expecting to be racing in Britcar this season, and will again be racing Roger Saul’s pre-war Alfa Romeo P3 Grand Prix car – and is working hard on plans to compete in the LMS and in the Le Mans 24 Hours.